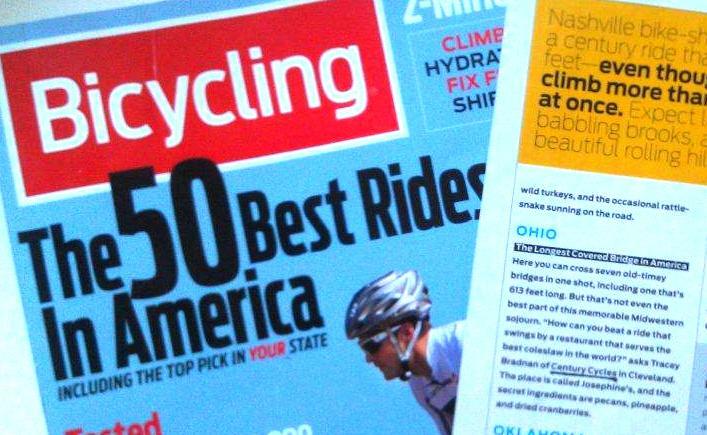 Check out Century Cycles -- featured in the cover story of the brand-new issue of Bicycling magazine! Krista's Ashtabula Covered Bridge Loop was picked as the best bicycle ride in Ohio and one of "The 50 Best Rides in America!" Here you can cross seven old-timey [covered] bridges in one shot, including one that's 613 feet long. But that's not even the best part of this memorable Midwestern sojourn. "How can you beat a ride that swings by a restaurant that serves the best coleslaw in the world?" asks Tracey Bradnan of Century Cycles in Cleveland. The place is called Josephine's, and the secret ingredients are pecans, pineapple and dried cranberries. On a staff full of bicyclists, Krista McNamee never ceases to amaze and inspire all of us to try new routes and ride more miles. The 47-year-old wife of a Cleveland Police detective has traveled much of Ohio and America by bicycle, including the Southern Tier Bicycle Route. Last year she rode a 900-mile self-supported tour of Nova Scotia, and this year she is planning to ride Michigan's Upper Peninsula once our busy summer season is over. Click here for details on Ohio's best ride, including maps and Krista's tips -- and be sure to congratulate Krista the next time you see her at the Rocky River store or riding her bicycle!